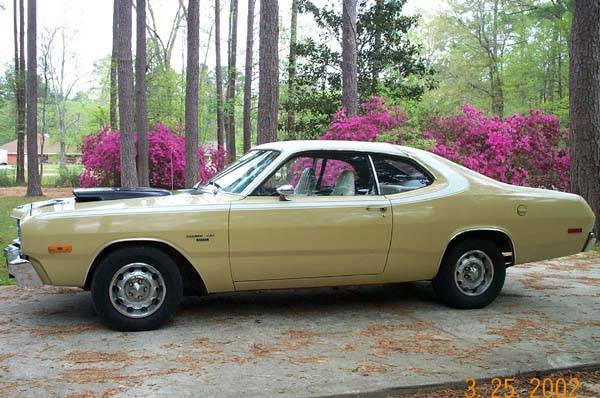 The 1973 Dodge Dart Sport was essentially a Plymouth Duster with some exterior restyling. It featured some restyling of the front and rear end of the car. A new grill with more fins and bulges gave the front of the car a busier appearance. As well, new taillights were developed which were two squares instead of the vertical slots used on the Demon in previous years. New bumpers were now used to meet new safety criteria. Despite the changes in appearance the car sold well. This was the last year for the 340 cid motor. However, the Dart Sport offered some rather exciting appearance packages that captured the spirit of the era. In particular was the Hang 10 model. This car featured the newly available sliding metal roof (Convertriple) with special lively graphics and folding rear seat. This model was designed for surfers and followed a surfing theme of lots of white, orange, red, and other high impact colors used throughout the interior. A graphic ran down the center of the hood in a surf board shape as well as on the quarter panel there was a surfer riding a wave. Another new model from Dodge was the Dart Sport Rallye. It was designed for drivers who wanted a more spirited ride without the poor economy of a straight line performance car. Essentially, the car featured better suspension and brakes. The cars also had a 318cid 4 speed and a Tuff steering wheel.